(Nanowerk News) Precision motion control systems specialist, PI (Physik Instrumente) L.P. just launched the new C-887.52, a sophisticated hexapod controller for parallel kinematics precision positioners that is based on the company’s 3 decades of experience with hexapod mechanics design and control. 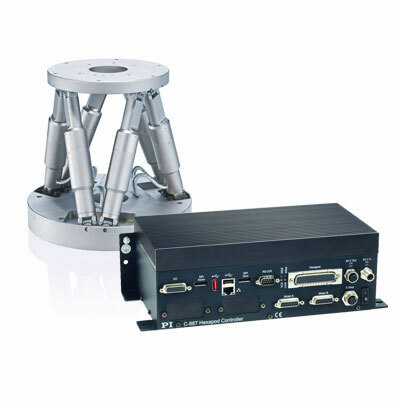 With a real-time operating system, 6-D vector motion control, a comprehensive high-level command set, and optional collision avoidance software, this compact bench-top solution will extract the maximum performance and precision out of hexapod parallel positioning systems. The C-887.52 makes control of the hexapod 6-axis parallel positioner easy. The user enters commands in Cartesian coordinates and the controller turns it into vectorized motion. High path accuracy and dynamic performance is guaranteed by fast servo update rates (10kHz) and error compensation. The user can also specify the center of rotation with one single command. A data recorder captures valuable data, such as velocity, position, and position error. In addition to controlling the 6 parallel kinematics axes of the hexapod, outputs for two more servo motors are included. The controller comes with a wealth of software programs for test, configuration, and simulation. Drivers and program examples for positioning and alignment are also included. Start up and operation is made easy with the PIMikroMove user software, providing a powerful graphical user interface that also displays scan routines. Communication is via USB and TCP/IP, digital and analog I/O. The built-in macro command language simplifies programming of repetitive tasks and also makes standalone operation possible as does the optional manual control unit. Custom controller designs are available, e.g. for use at high altitudes, for applications requiring increased safety using redundant systems, and for closed-loop alignment application using optical feedback.